Recycle and Make Great Crafts! There are tons of ways people are reusing old jeans. From making potholders to unique gift-wrap, reusing blue jeans is a great way to recycle. There are many ways to recycle jeans. With a little creative thought they can be used to make household accessories, fashion items and much more. Potholders - Whether you cut out blue jean pieces or used the back pockets, make handy potholders by stuffing with quilt batting and stitching up the sides. If you have younger children, use your sewing machine to stitch and let them stuff before closing the seam edges. Make A Scarecrow - This is an easy way to reuse old blue jeans and your child doesn't need to worry about needles, thread or a sewing machine. Stuff the jeans with old rags, pillows or straw. Let you child use their imagination and offer to make one for a retired neighbor during the Halloween or fall season. Gift-wrapping - This is a great project for you to do with your kids. First you will need to cut the blue jeans and lay them flat on a hard surface. Wrap blue jean pieces around a gift box and secure with yarn in fun colors or glue to the gift box and decorate with embellishments. If you require longer or wider blue jean pieces for your gift-wrap box, another good tip is to hole punch the blue jean and stitch with yarn. Christmas Stockings - Cut the blue jeans into a stocking shape, hole punch and use a wide stitching needle. Choose yarn colors that are green and red to reflect the Christmas holiday. If a needle isn't desired, have your child hand thread the yarn through the punched holes. Picture Frames - Buy some old picture frames at yard sales or reuse some old frames and glue blue jeans to the frame and add embellishments like buttons or bows. Pump It Up - Use old white, pink or striped blue jeans to make patches and sew on your new blue jeans. This is a great way to save dollars on buying jeans already pumped up while recycling at the same time. Purses - You can make anything from full size purses to tote bags to book bags with old blue jeans. Let the artist in you shine and make backpacks that include sewn in photographs so your child will always be able to identify their own. Use frayed edges as trim for an in-style look. Book Covers - Recycle old blue jeans by using them as book covers or photo album covers. Use glue or double side sticky tape to secure. Utensil Holders - These are fun to make by using your favorite heavy-duty material or canvas and sewing on a back jean pocket. Keep wooden spoons, favorite knives, and spatulas in these utensil holders. Heating Pad - Stuff thinner blue jeans with rice and sew for a great microwave-heating pad. Be careful not to use any metal pieces from the blue jeans and remove zips and metal buttons. These are great as ice packs too! Plastic Bag Holder - These are becoming so popular even big chain retailers sell them. Use the leg of one pair of jeans and hem one end and hem the other end with elastic inside. Use jean scraps to make a handle; this is a great way to store and recycle grocery store bags. Quilts - If quilting is your game, make an entire quilt by reusing old jeans. This can also be a fun crafting experience to share with your kids or make an heirloom quilt. Desk Sets - If you have a worn desk set or find a used one at a garage store or thrift shop, make it new again by gluing blue jean material and buttons and even embroider to revive it. This idea is great for all sorts of wooden containers you have but just don't want to part with. 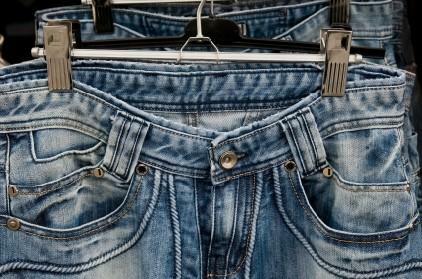 Go to yard sales, thrift stores or ask your friends and family to save their old jeans. Invest in a sturdy pair of scissors to make cutting easier. Don't forget the zippers or buttons on the jeans! Reuse them as embellishments on your recycled crafts. Keep an eye on your children, especially the younger ones when crafting with old blue jeans. Use your imagination and think of other ways to reuse old blue jeans. Look for yarn, buttons, and other items at yard sales you can used as embellishments on your blue jean creations. Reusing old blue jeans can be anything from wall decorations to cool can cozies. With a little imagination and your craft skills, you'll never waste a pair of blue jeans again!